Demolition of the old Lister's factory buildings continued through the month of February and more and more heaps of rubble and twisted metal are appearing around the site. It's sad to see these buildings disappearing, where once so many earned their living and so many fine products were turned out and which went on to represent the craftsmanship of Dursley throughout the world. Another event during the month saw the return of a restored Dursley Pedersen bicycle back to the Heritage Centre after a year long restoration. This restoration, carried out by Michael Kemper from Germany, converted a corroded and derelict bicycle to a thoroughly presentable exhibit. The site of the Lister Shearing buildings is on the left in this view back along the entrance road back towards the security building. Inside the Lister buildings the scene makes a depressing sight, now deprived of its once thriving activity. Another scene of dereliction as the remaining buildings on the site stand defiant in the face of destruction. The old boiler room of the Lister factory, no more to provide heat for the factory. A view from the north side of the Lister site showing more new housing under construction. 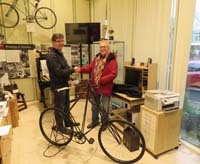 After a year long restoration, the once derelict Dursley Pedersen bicycle belonging to the Heritage Centre has been returned to something much closer to its original state and makes a welcome return. This restoration was carried out by Michael Kemper (left) from Germany, who came over for the presentation. Also pictured is David Evans from Dursley, who wrote the standard reference work on the bicycle. A small parade of people and ponies made a brief appearance on Castle Street on their way from Uley to Sainsbury's to help raise finds for Macmillan Nurses.